In my years of travel I have had many detours, delays and changes of schedule. However, my two biggest detours have involved trips to one country. Today was the 17th anniversary of one of those detours and the other happened earlier this year. One of the biggest detours was the result of September 11. 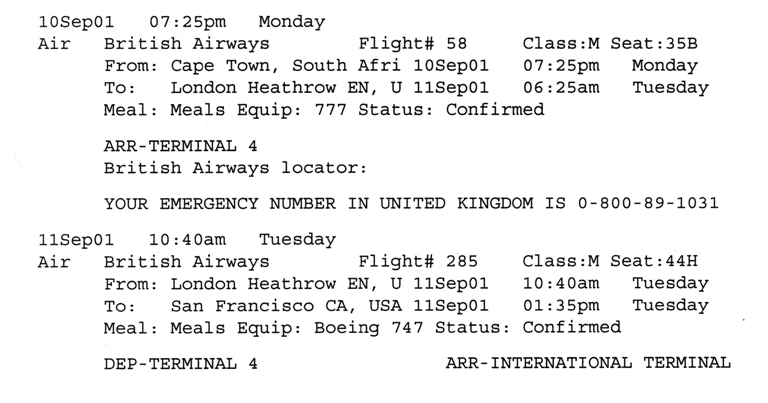 You can see in the picture above that my schedule was to fly from Cape Town, Africa to London and then on to San Francisco. The first flight was uneventful, but the second flight landed in Edmonton, Canada instead. 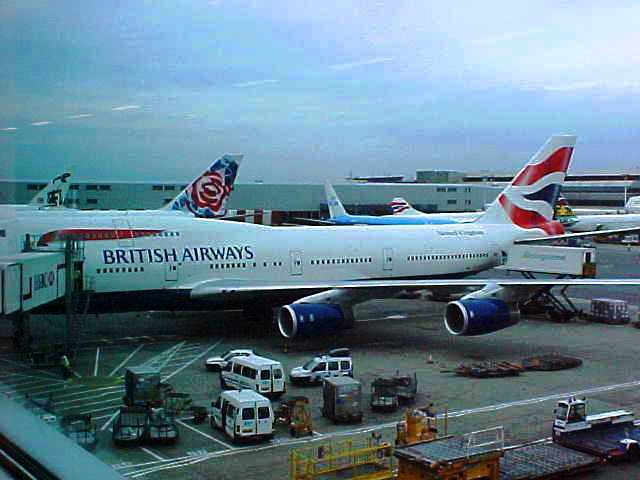 I then flew back to London and stayed there a few days before eventually flying home to San Francisco. You can read more about this trip in September 11 Memories and 17 Years Ago on September 11. The trip in 2001 to South Africa was my first trip there and I hadn’t been back until this year. I started my trip this year by flying to Zurich and then spent all day in the airport waiting for my flight. As the flight time approached I made my way to the gate and found out that due to a passport issue I was unable to continue on to South Africa. I retrieved my bag and waited until morning when I could get a flight back home to get a new passport. See my post In the Wrong Place for more details. Later that week I was again on my way to South Africa. I decided this time to steer clear of Zurich and connected in Frankfurt. 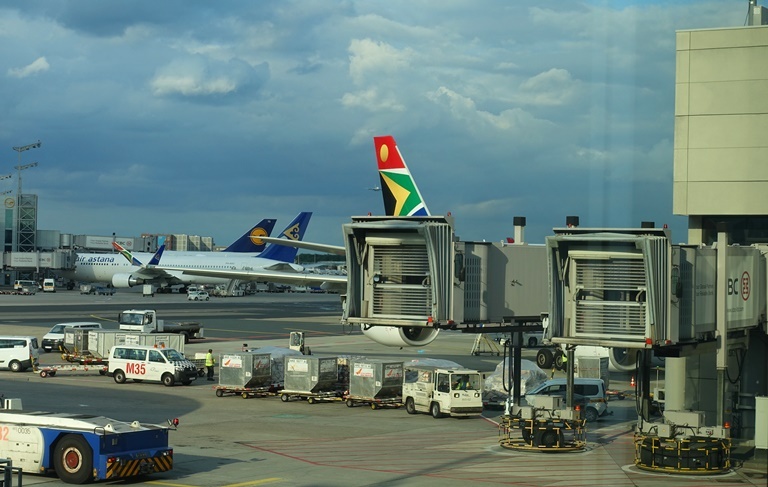 Here you can see the tail of the South African plane. Fortunately the flight home (See: JNB to SFO) was uneventful. It was definitely a coincidence that my two biggest detours have been on trips to South Africa. I am sure that if I visit there a third time that I will have a trip without detours. Now for some sleep after an emotionally draining day. September 11 always brings back a lot of memories. 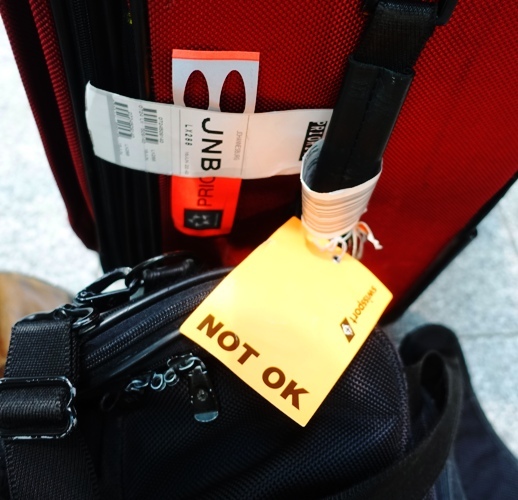 This entry was posted in Culture, South Africa, transportation, Travel and tagged Flight Delays, Flight detours, Frankfurt, September 11, wrong place, Zurich. Bookmark the permalink.